As you flick through your holiday photos while the rain drizzles outside your window, the summer may already seem like a long time ago. But some scientists will soon be looking even further into the past thanks to images now being taken on the world's most powerful digital camera. For over 500 nights over the next five years the Dark Energy Camera will photograph the light from more than 100,000 galaxies up to 8 billion light-years away in each image. More than 200 scientists from across the world will use these images to conduct the Dark Energy Survey, aiming to understand why the expansion of our Universe is accelerating. Say cheese, galaxy NGC 1398! 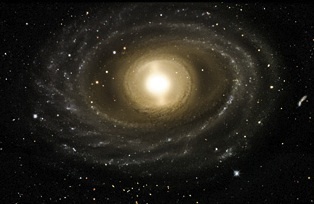 This galaxy lives in the Fornax cluster, roughly 65 million light years from Earth. It is 135,000 light years in diameter, just slightly larger than our own Milky Way galaxy, and contains more than a hundred million stars. Credit: Dark Energy Survey. Although this was a revolutionary discovery, the concept of a repulsive version of gravity has actually been around for nearly a century. When Einstein created the theory of general relativity he included a repulsive component of gravity, called the cosmological constant, in order to balance his equations so that the Universe was static, neither expanding or contracting. Of course we now know the Einstein was wrong on that small point, the Universe is not static, but a cosmological constant of the correct value could explain the Universe's accelerating expansion. The value of the cosmological constant could be explained by the vacuum energy of empty space predicted by particle physics, as quantum mechanics decrees that the vacuum is in fact a seething mass of virtual particles popping in and out of existence. But the problem is that the value observed at the cosmological scales is quite a bit smaller, about 1060 times smaller in fact, than that predicted by particle physics. It's clear we have quite a lot to learn about dark energy. 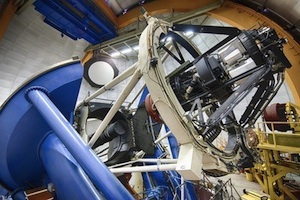 The Dark Energy Survey will use images taken by the 500 megapixel Dark Energy camera (DECam) mounted on the Blanco telescope at the Cerro Tololo Inter-American Observatory in Chile to gather a variety of information. The wavelength of light from Type 1a supernovae is stretched as it travels over long distances through the expanding Universe, a phenomena called redshifting. These supernovae are well understood and this redshifting provides a standard candle for measuring cosmic distances. The DECam will photograph around 4000 new supernovae at distances far exceeding those observed before, allowing the scientists to determine the history of the cosmic expansion rate. This and other information will be compared with how the clustering of galaxies of particular sizes have changed over time. The interplay between dark energy and gravity influences the development of galaxies and dark energy drives their expansion in size. By comparing the resulting information on the rate of growth of galaxies with the expansion history derived from the supernovae data, the cosmologists will be able to see if Einstein's theory of general relativity (with the cosmological constant) is sufficient to explain the accelerating expansion. Or if some new theory is needed. "The Dark Energy Survey will explore some of the most important questions about our existence," said James Siegrist, associate director for High Energy Physics at the U.S. Department of Energy's Office of Science. "In five years' time, we will be far closer to the answers, and far richer in our knowledge of the universe." We look forward to the slide show of their holiday snaps from the other side of the Universe. You can catch a first glimpse of the views from the DECam and find out more about dark energy on Plus.